It's retro-project day... 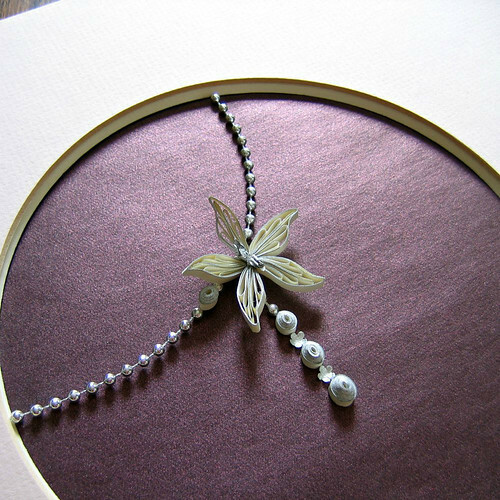 I shared this photo recently on Instagram of an orchid necklace (actually intended to be a framed piece) that I made quite a while ago. Because a couple of people asked about the center, I thought I would post close-ups to show it a bit better. The dimensional lip and column (orchid terms; oh the things you learn via Google) are made of hand cut foil pieces I scavenged from a yogurt container and shaped by rolling around the tip of a paper piercing tool. The tiny punched flowers that hang down from the flower are also foil. I like to use this type of foil because it's hefty, textured stuff that stands up to lots of handling. 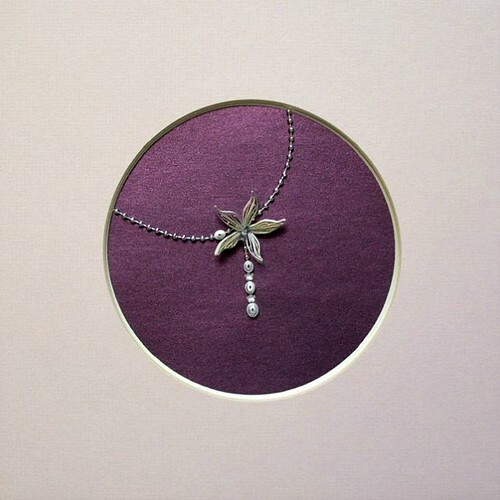 It was the pale pink mat with its circular opening that started the wheels turning on the necklace idea in the first place... it's feminine, so what better to go inside than delicate jewelry? A tip for designing quilled flowers is to google clip art images of whatever one you have in mind. Line drawings simplify Mother Nature's handiwork. While I'm talking tropical flowers and textured foil, here's one of my very first wedding invitation mats. It features trumpet flowers made with the same type of foil, along with green vellum peduncles (who comes up with these names?!) and alternate side loop leaves. The sculptured sweet peas on this recent marriage certificate were a similar type of foil from a different brand of yogurt - the foil was silver on one side, white on the other. As for traditional supplies, both projects were quilled with silver-edge paper called A Touch of Silver made by Lake City Craft Co. 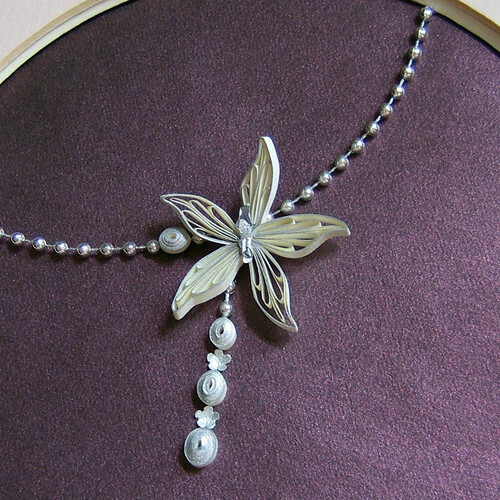 The silver doesn't have the same bright shine as the metallic-edge type from JJ Quilling Design that I often use to make jewelry, but it's very nice in its own subtle way. 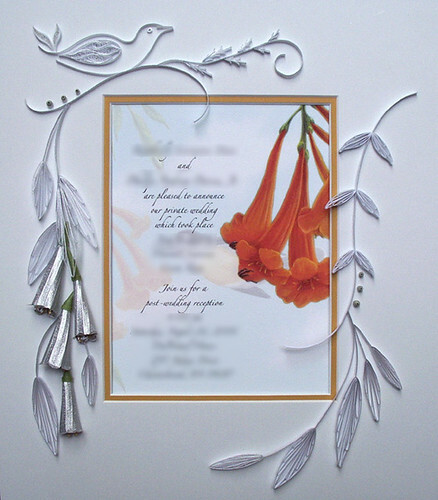 Lake City quilling paper is available directly from the company, plus many other suppliers stock it. For example, Custom Quilling, which is where I got mine for these projects. The burgundy metallic background paper and arc of tiny silver beads that gives the effect of a necklace were also from Custom Quilling. I hope these projects will give you some ideas of your own. Speaking of ideas, a few quillers have asked if they can sell items they make from my tutorials. While I'd love for you to recreate my designs that you see on this blog for your own personal use and/or to give as gifts, the Creative Commons license that is posted on the sidebar indicates the content I share is not for commercial purposes. Such beautiful art you always share with us! I especially like the orchid. I think I will try to make one for a dear friend with a birthday next month. It really helps to see the close up pictures. Love your blog! That's so nice of you to say, Pamela, thanks! I hope you'll enjoy making a quilled gift for your friend. Love the clever work with the foil, stands out well and looks beautiful. I love this design so much Ann. It's so delicate and beautiful. Your quilling is so delicate and stylish. I love how you make quilled birds with a few simple lines but so effective. Necklace is beautiful and delicate.Thanks Ann for sharing. Thank you, Suganthi and Anita! How creative to use the foil from yogurt cups! Yes, it is definitely a tougher foil than you find elsewhere. Love your delicate orchid! Thanks so much, Honey! Yes, it's really strong, forgiving stuff.